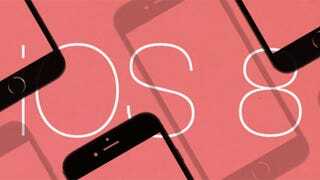 By now you've no doubt downloaded and installed the shiny new iOS 8 on every device you own that can take it, but what if Apple doesn't know best? What if some of the new features are a hindrance rather than a help? You can't turn back the clock completely, but you can disable some of the changes ushered in with iOS 8. Lifehacker's got a great guide of their own, and we've got a few more to add. Everything you need is somewhere around the Settings app, but in case you can't find the relevant option we'll point out exactly where it is for you, and explain why you might want to disable it in the first place. iOS 8 will merrily display your recent contacts every time you view the multi-tasking screen (two taps on the Home button). If you'd rather not be reminded of the people you were recently chatting with (or you don't want anyone who looks at your device to find out), head to Mail, Contacts, Calendars in Settings and change the Show In App Switcher option to Off. Spotlight search has been enhanced to include even more results beyond those it finds on your current device. Results from iTunes, the App Store, nearby locations and the Internet at large are all included by default in iOS 8—if you'd rather undo this change, head to General in Settings then tap Spotlight Search and disable the options you don't want. Being able to summon up Apple's digital assistant with a quick "hey Siri" from anywhere in the operating system may be useful sometimes, but not everyone will love it. Perhaps you're constantly surrounded by iOS devices and don't like the thought of them always listening. Perhaps your accent accidentally launches the feature once too often. Perhaps your dog's called Siri. In Settings, tap General then Siri and disable Allow "Hey Siri". Apple's new Health app is designed to be a central hub for all of your medical and fitness information, but if you decide there's something you want erased from the records then a few taps are all it takes. From the Health app, choose Health Data, Show All Data and Edit. Tap the red delete icon next to any information that you no longer want stored. iOS 8 lets you install third-party keyboard apps for the first time, but maybe you want to go back to the Apple default. It's easily done: From Settings, choose General and then Keyboard. If you tap Keyboards you will see all of the keyboard apps currently available—tap Edit to change the order in which they appear. You may need to press the Earth symbol on your keyboard the next time it opens to make the change stick. Predictive text is another new feature ushered in with iOS 8. You can disable this from the same Keyboards screen—it appears with several other options underneath the list of installed keyboards. And if you find you really don't like one of the keyboards you've installed then you can delete it from your iDevice by pressing the red delete button next to the relevant entry on the Edit menu. We've spoken before about not upgrading to iCloud Drive before all of your devices are running iOS 8 and OS X Yosemite. If you've taken the plunge, you can't go back to the older version of the service. Turning iCloud Drive off will simply stop syncing your files. The only solution is to get all of your devices and computers running the latest software as quickly as you can. The new features in Messages, the changes to the Notification Center and most other alterations are fixed as well, so there's no going back. At least the Notifications option in the Settings app gives you plenty of control over what apps are visible and the information that each one can display, so there are opportunities to customize it to suit your preferences.